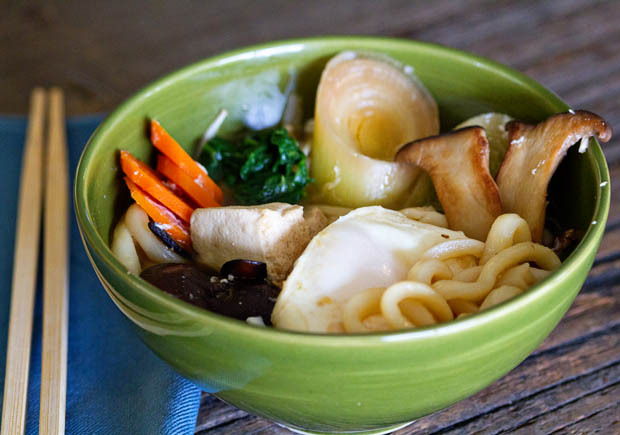 * Makes 6 to 8 servings * This udon has the thick chewy udon noodles and vegetables of the regular nabeyaki udon, but is made with a mushroom stock base. Plus it sports three varieties of mushrooms—shiitake, king trumpet, and enoki mushrooms and cubes of sautéed tofu. If you can’t find some of the mushrooms, substitute your favourites! Have other favourites – then try them out. For Vegans don’t use eggs in this recipe. Place the dried shiitake mushrooms and kombu in a pot with the water. Bring the water almost to a boil and then turn down the heat to maintain a simmer. Simmer for 5 minutes. Remove the pot from the heat and let the stock stand for 3 minutes. Squeeze the mushrooms to release the stock they have soaked up, then strain the stock through a fine-mesh strainer and set aside. Cut off and discard the shiitake stems, then cut an “X” into the top of each mushroom cap and set aside. Bring a large pot of water to a rolling boil and cook the spinach for one minute. Quickly drain the spinach and plunge it into a bowl of cold water. Drain and rinse with cold water until the spinach is completely cold. Squeeze out the water, then cut into 1-inch lengths. Heat the sesame oil in a saute pan, then add the sliced king trumpet mushrooms and pinch of sea salt. Saute until the mushrooms are cooked through, browned, and starting to become crispy in places. Remove the finished mushrooms to a bowl and set aside. Add the cubed tofu to the pan, adding additional oil as necessary to prevent the tofu from sticking to the pan, and sauté until the tofu is browned. Mix the mushroom stock, soy sauce, mirin, and salt together in a 4-quart saucepan, then stir in the garlic and ginger. Add the sliced carrots, leeks, and shiitake mushrooms, then bring to a boil over medium heat. Simmer until the carrots are tender. Add the udon noodles, king trumpet mushrooms and tofu, then place the spinach in 5 small bundles on the top. Separate the enoki mushrooms into 5 bundles and place them on top of the soup. Gently crack the eggs, one at a time, into the soup. Cover the pot with a lid, and let simmer for 3 minutes, then turn off the heat and let sit to allow the eggs to finish cooking. Serve hot. Garnish with shichimi togarashi, if desired.